In Twproject you can always check the load of your resources, as much information you set in Twproject as much your graphics will be close to reality. The first thing you need to say to Twproject is how much you intend to work on a project: an estimation. This estimation can be set on assignments – that is already quite fine grained. If you are breaking down the task with issues, you can even estimating by quantifying each issue. The estimation is set as an agreed result, is a way to get people involved and committed: it is a public commitment. So it is useful even if it turns out to be inaccurate. 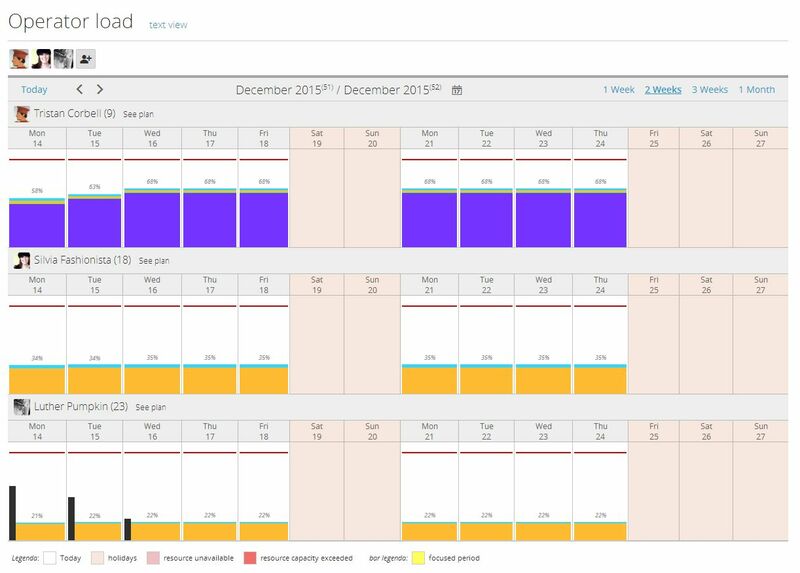 In this page for every resource in the selected workgroup you will get a graphical representation of the load total by day, every color represent a different task. By clicking on a column you will get a detailed explanation of the components of the load. If you prefer a text-based representation, click on “text view”. This is a 2 weeks view, there is also “one week”, “3 weeks”, “one month” available. 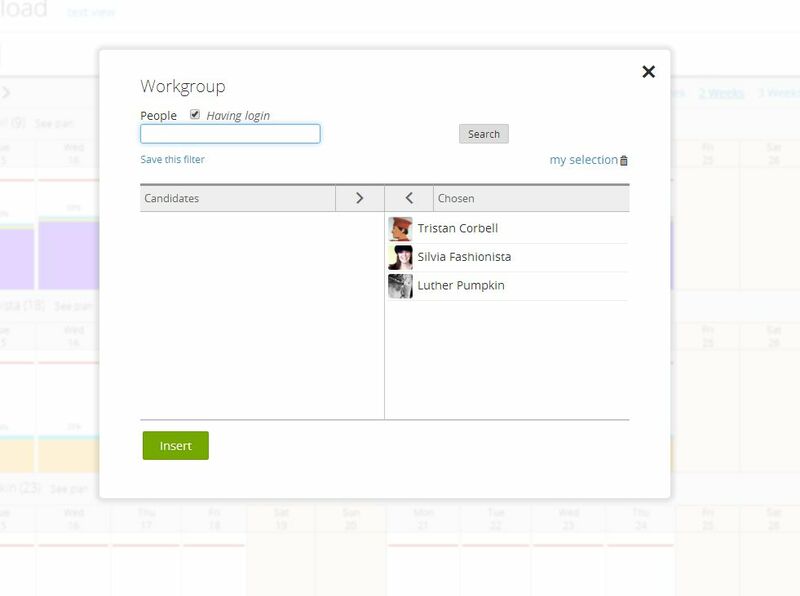 You can even move in time by clicking the bottom bar or add someone to you workgroup by clicking workgroup. Since version 6 the work load information is available every time you create a new assignment. When you will chose one of your resource you will immediately know her work load, so deciding which will be the best resource to assign will become much easier. – Project A lasting 5 days with a resource assigned (Resource R1) with an estimated worklog of 25 hours. – Project B lasting 2 days with a resource assigned (Resource R1) with an estimated worklog of 12 hours. According to this data the work load will be distributed equally in the five days (5 hours per day). 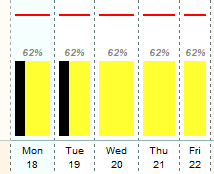 The percentage represents the estimated worklog for that day according to the working hour per day of the resource (represented by the red line). You see the load of these two tasks below. Project B lasts 2 days with an estimated worklog of 12 hours which should generate 6 hours per day of work. Project A lasts 5 days with an estimated worklog of 25 hours which should generate 5 hours per day of work. 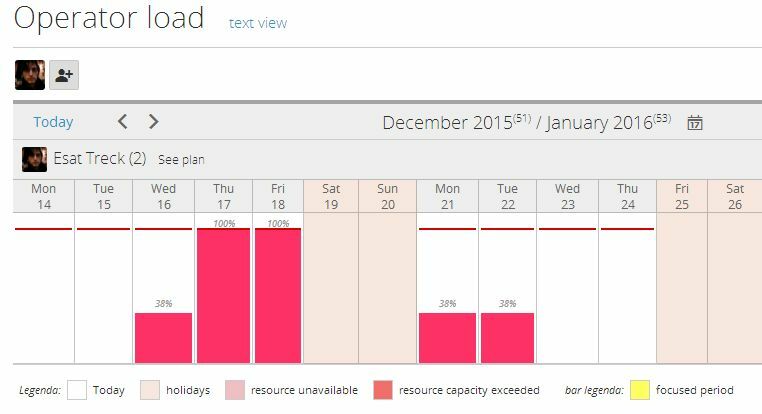 As you can see from the picture Twproject does not simply sum the two estimations for each day but tries to distribute the work load so that the resource does not exceed his/her working hours per day, in this case by increasing load in the less booked days. The main difference looking at the operator load including task in the past is that in this case we have to consider also the work done and not only the estimated one. The picture below shows again the load of Project A (moved to intersect today). The dark bar represents the inserted worklog. The total estimated worklog was 25 hours, we already did 10 hours (5 hours on Monday 13 and 5 hours on Tuesday 14) so we still have 15 remaining hours which have to be done in 3 days. In this case the load still shows you five hours per day also for the future days. Now we consider what would have happened if the resource had not recorded worklog for Tuesday. As the estimated worklog for Tuesday has not been done the load for the next days increased. 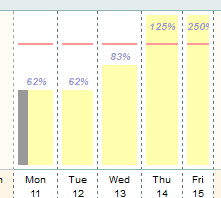 The total estimated work was 25 hours, we did 5 hours (instead of 10, there is not the grey bar on Tuesday) so we have 20 remaining hours of work which have to be done in 3 days, this is the reason way the load for the future day is increased to 83%. Here is what you see when you enter in the plan for the resource R1. The first row represents the operator load that is there to help the user to correctly insert the plan. In this case we are looking at a future task so the estimated work is distributed equally through the task days. The pictures show that according to the plan the operator load is changed; in fact we have a load of 8 hours for the two days selected and the remaining hours are distributed on the 3 days left. What we hope to have shown is that plan and load interact and get filled up from every possible source in real time – which is Twproject’s focus.